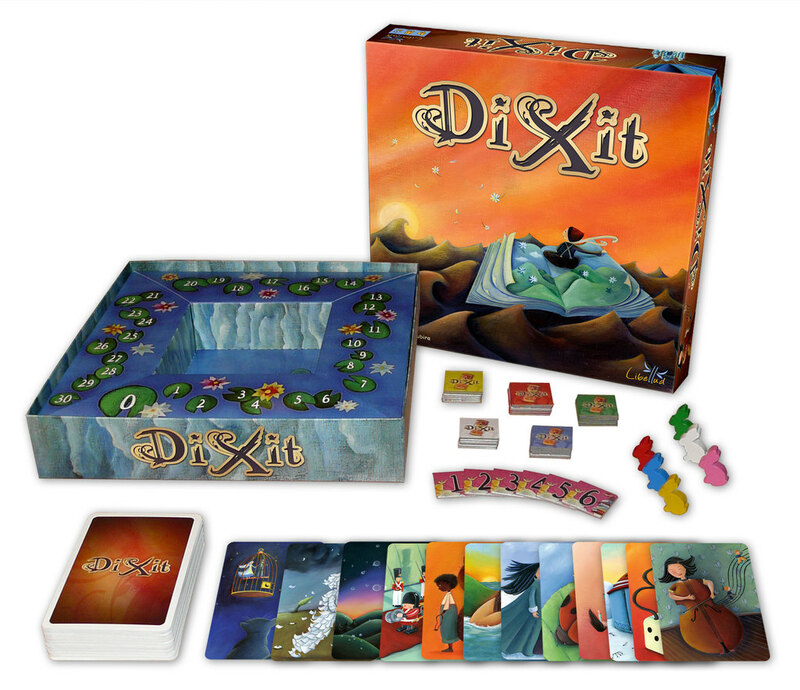 Dixit is a board game for 3 to 6. 1 person is nominated as ‘The Storyteller’, and deals each player 6 picture cards. Each card has a illustration on it, not of anything totally specific, but more like a painting or work of art, into which you can read a variety of possible scenarios. The Storyteller then picks a card from their hand, and without showing it to the other players, tells them a sentence they think describes, or emotes the card. This can be a single word, or a poem, or even a line from a movie. The other players then hand over a card from their hand to The Storyteller that they think most closely matches the sentence from The Storyteller. The Storyteller lays mixes the cards they have been given and lays them out in a random order in front of them. It’s now up to the other players to pick out The Storyteller’s card from the selection. If the other players all guess correctly, they each get 2 points, and The Storyteller gets 0. If The Storyteller manages to fool even 1 of the players into picking someone else’s card, they get 3 point, along with anyone else that guessed The Storyteller’s card correctly. The Storyteller duties then pass to the person on their left, and the round begins again. The games ends when all the cards have been used, or a player reaches 30 points. The game comes with 84 beautifully illustrated cards, and a game board with 6 wooden multi-coloured rabbits and a scoreboard to help you keep track of who’s winning… Not entirely sure why they went for rabbits, but given how abstract the entire game is, they don’t really feel out of place! 😉 All the pieces feel well made, and of a decent quality. Dixit is a odd, somewhat surreal, abstract game, that relies heavily on the players imagination. It took a little while for our testers to wrap their heads around the sort of sentences you needed to come up with. Too obvious, and you risk everyone picking your card out too easily. Too abstract, and it causes arguments about how your phrase bears no resemblance to the card (so be prepared to back up your idea!) I liked the fact it’s very much a family game, that could be played using the wild imagination of small children, or the wily old cunning of a grandparent, each having equal fun. As I mentioned, it took a little while to get into the mindset of the game, but after we’d been through one round, we wanted to try it again. The one criticism would be that, even with just 4 players, you could do with more than 84 cards. They do sell additional card packs (also of 84 cards), but I’d like a few more in the basic game, as I suspect you’d get to know the basic set pretty well very quickly. Overall, it was a fun and entertaining game that can be played by all the family.